Bio-Rad Bio-Plex Pro II Wash Station Microplate Washer 30034377 Biorad . New Life Scientific, Inc. 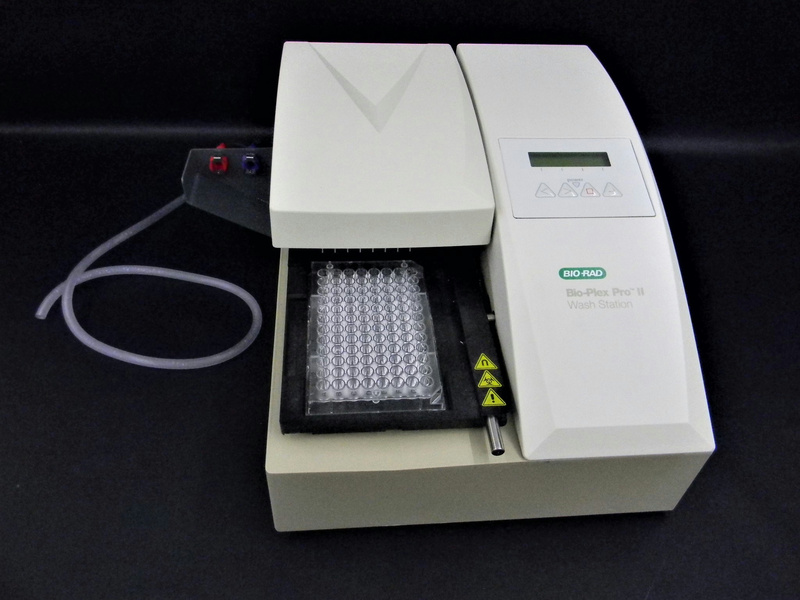 This is a used microplate wash station that is in good working condition; it was tested by New Life Scientific technicians and was observed to be in perfect working condition. The technicians used distilled water to test this microplate washer. The pumps were primed and expelled waste water. The pump removed liquid in the microplate wells and aspirated two rounds of distilled water for rinsing the plate. The plate is then dried and ready for storing or future applications. The techs only tested using "L1" & "L2" reservoirs. This does not require a PC to run it is internal software. **The vacuum and magnetic plate carriers designed for this instrument we do not have, they may be available from other resellers, but we are not responsible for acquiring them. The Bio-Plex Pro Wash Station eliminates manual wash steps from Bio-Plex Assays, making them as easy as ELISAs. The wash station is specifically designed to perform Bio-Plex Assay wash steps, but it is also compatible with any standard xMAP assay. Please visit here for more information and specifications from the manufacture. Please visit here for instructions for use.